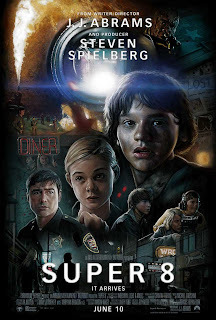 First off, Super 8, a new film from Steven Spielberg. We had little idea what this might be all about, having picked it off the shelf of Blockbusters in desperation. As it turned out, it's not a bad little film at all. I was initially concerned that it might be like Blair Witch or Cloverfield, presented as though it had all been filmed on 8mm stock by a bunch of kids, but thankfully it's not like that at all. The plot follows a group of children in an American Town. They are making their own 8mm zombie film, and have roped in various friends to help. The main focus is a boy called Joe who recently lost his mother in an accident at work. Joe is doing the make-up on the film (as he is a dab hand at making horror model kits) and takes a shine to Alice, the daughter of a man who his father (the local deputy sheriff) blames for the death of his wife - I hope you're following all this! - as he went off sick on the day she died and she did his job instead. Anyway ... it's 1979 and these kids are filming some stuff at the local train station, when a train comes through and is hit by a man in a van causing destruction of the train in flaming fireballs. The kids try and film some of the aftermath, but something alien, alive, and angry was on the train and it escapes. Thereafter the kids use the army men as a background to their own film, as the army cordens off the place and tries to find the alien while it rampages about killing people and generally causing havoc. Joe also has a strange white cube that he found at the crash site ... a cube which seems to have mysterious properties. I liked the way the film built, the characters were all good, and you could relate to them. If I have a criticism, it's that the alien isn't seen soon enough - you get lots of fast CGI flashes, but the slow burn to its eventual reveal is too long! But the effects are good, and the ideas original. 1979 is very well recreated, with no mobile phones or video - instead they have to wait 3 days for their film to be developed ... I remember those days well! The ending is a little ET (well, this is Spielberg) and of course Joe and Alice are united as best friends. Overall, it's maybe an 8/10 from me. 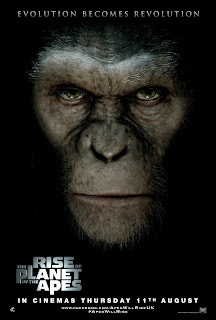 Next up we decided to sample Rise of the Planet of the Apes. An interesting idea, to create a prequel to the original Planet of the Apes films, but the downside of doing that is that you know what the plot is and what the outcome will be. Despite this, we really enjoyed the film. 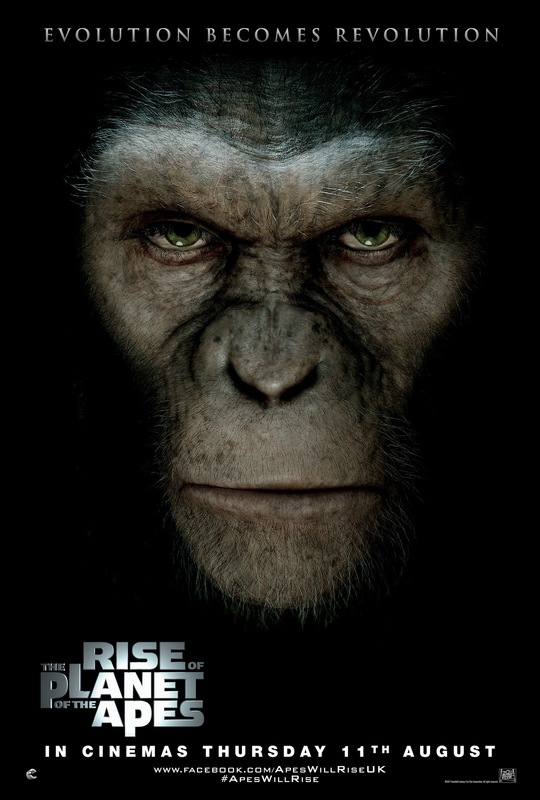 The main reason for the enjoyment is the simply amazing, standout performance of Andy Serkis as Caesar the ape. I feel that Sirkis is simply the best at this sort of thing. His performances made the Lord of the Rings trilogy and the recent King Kong remake, and the argument that he is not worthy of any award for his work as these characters are CGI is a nonsense. Without Serkis' heart and soul, the characters would be dead. As it is, they live and breath and you totally understand them. Thus it is with Caesar. The film follows his life from a baby rescued from an experimental facility where they are trying to find a cure for conditions like Alzheimers by experimenting on apes, to his life as the 'pet' or more truthfully companion to the scientist who rescued him, and then to his teenage and adult years. Sirkis brings real pathos to the character, and his facial expressions and body language is awesome. Caesar is eventually confined to an ape sanctury sort of place where the beasts are abused, and slowly Caesar uses his enhanced intelligence to work out how to escape. The film ends with the apes rampaging through the city, destroying all before them ... and you are on the side of the apes the whole time! I loved the film. I thought it was well made and had heart and feeling. I cried with Caesar at points, and the action scenes made me cheer with enthusiasm. So for a film which set out to join some pre-existing dots, it does so much more. Certainly a 9/10 from me, and the hope that Sirkis finally gets some industry recognition for his amazing work. The final film watched this last week is Captain America: The First Avenger. Now I've probably mentioned before on this blog that I'm not a comics fan, so as usual I have no idea how accurately the film follows the comics. It's basically about a man who wants to be a soldier like his Dad, but who is too small and sickly to get in. This is until he stumbles across a government programme to actually find a soldier who has heart and who cares for others rather than someone strong and fit. So the weedy Steve Rogers is pumped full of some experimental stuff, and is transformed into the tall and strong Captain America. The realisation of this is all quite clever, as Rogers is physically shorter and very weedy beforehand, and is tall and muscly afterwards - yet both parts are played by the same actor, Chris Evans (the flamey one off of The Fantastic Four). His nemesis is the wonderful Johann Schmidt, played by the even more amazing Hugo Weaving (The Matrix and Lord of the Rings amongst others). Johann is really a character called Red Skull, so called because he has a ... red skull ... and I'm not sure why he pulls his human face off mid-way through and then never replaces it - why bother with the human face at all in that case! Never mind. 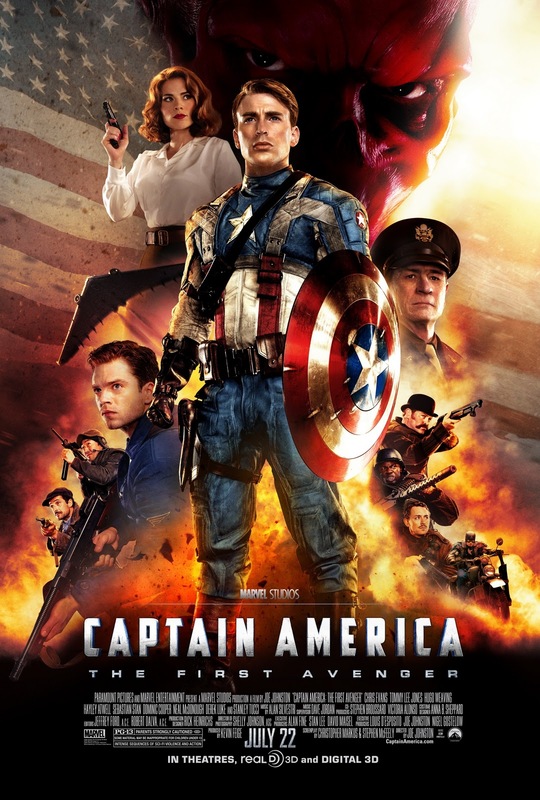 The film follows Captain America as he is initially used for propoganda by the Army, but then single-handedly rescues 150 men from behind enemy lines. He then lines up for the final face-off battle against Red Skull who plans to deliver nuclear bombs to all the major cities of the earth. It's fast and furious, well made and pretty exciting in a 'leave your brain at the door' way. The characters are all larger than life, and Captain America makes a pretty neat hero all told. Probably give this one something like 8.5/10. It's worth watching! Interesting reviews David. 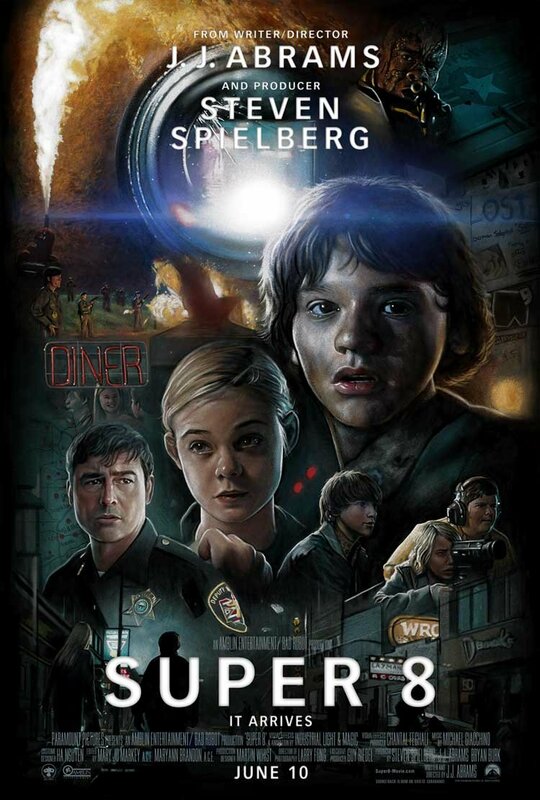 I haven't seen either Super 8 or Rise of the Planet of the Apes (and frankly the latter doesn't interest me at all. I did see Captain America and concur with your review; I actually think its one of the strongest films Marvel have done and that its aided by the fact that in many ways its not a superhero film but a war filmy with superheroics in it. I know its a tiny difference but its definitely there.